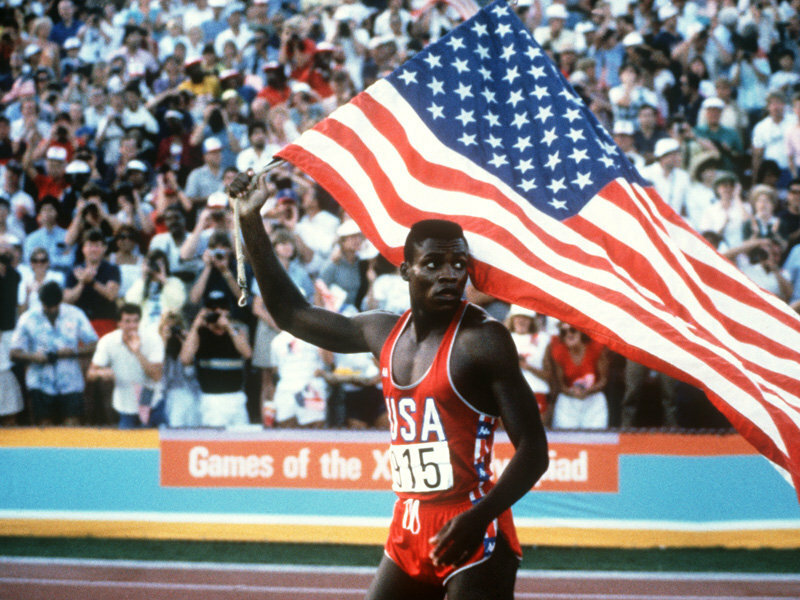 The 1988 Seoul Olympics will be remembered chiefly for Ben Johnson. On the 24th of September 1988 he ran the 100m in 9.79s, breaking his own World record of 9.83s, which he had set in the 1987 IAAF World Atheletics Championships in Rome. Within 48 hours of his Olympic victory, he had been exposed as a drug cheat. The 1988 Olympics virtually came to a halt, so shocking was the news. Ben Johnson winning the 1988 Olympics 100m. Within 48 hours, he was exposed as a drug cheat. Here is a video of that dramatic 100m final. Looking at it now, one can see that Johnson looked like a man possessed. He exploded out of the blocks, and no one else in the race came close to catching him. 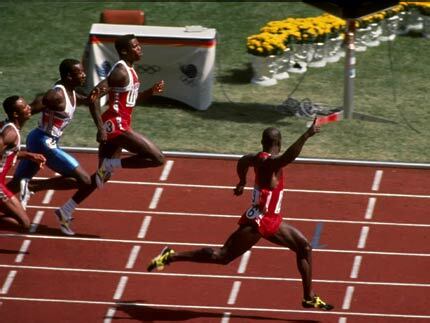 Ben Johnson had come 3rd in the 1984 Los Angeles Olympics in a time of 10.22s. After this defeat, Johnson’s times steadily improved, and he started beating Carl Lewis on a regular basis. We now know that much of this improvement was due to his taking performance enhancing drugs. In the 1987 World Championships he won, in a World record time of 9.83s. Johnson was subsequently stripped of his 1988 Olympic Gold medal, which went to Carl Lewis who had finished in 2nd place. Linford Christie of Great Britain was promoted from 3rd to 2nd place. After admitting to taking performance enhancing drugs, Johnson was also stripped of his World record and Gold medal from the 1987 World Championships. His Gold from the 1985 World Indoor Championships, however, remains on the record books. A BBC programme about this race can be found here. This programme also has been posted to YouTube, you can see it here (although it may get removed due to copyright infringments). This TV programme points out, and it is also mentioned here, that Ben Johnson was not the only runner in that 100m final to be implicated in taking performance enhancing drugs. 4 of the other athletes, namely Carl Lewis, Linford Christie, Dennis Mitchell and Desai Williams were all found at some point in their running careers to have used banned substances. If the men’s 100m saw a dramatic World record being set by Ben Johnson, the Women’s 100m and 200m also saw Olympic and World records, by Florence Griffith-Joyner. She won the 100m in a time of 10.62s (an Olympic record), and the 200m in a time of 21.34s. Her 100m World record of 10.49s, set in July 1988, and her 200m time set in the Seoul Olympics, are both still World records 22 years later. This is a video of her winning the 100m final in Seoul. And, here is a video of her winning the 200m final in 1988. Although Flo-Jo never tested positive for performance enhancing drugs, she died at the young age of 38, from an epileptic seizure. To this day, it remains an unanswered question as to whether her amazing World records and early death were due to long-term steroid use. For me, the other iconic moment of the 1988 Seoul Olympics was the US diver Greg Louganis smashing his head on the 3m springboard during the preliminary rounds. Here is a video of his doing this. Remarkably, despite suffering a concussion, Louganis went on to win the finals of the 3m diving the following day. For me, the highlight of the 1984 Olympics in Los Angeles, apart from the man wearing the jet pack in the opening ceremony (see a video here), was probably Carl Lewis emulating his hero Jesse Owens. Carl Lewis attempted, and succeeded, in winning the 100m, 200m, Long Jump and 4x100m relay, just as Jessie Owens had done in the Nazi Olympics of 1936. Lewis’ first Gold medal was in the 100m, on the 4th of August. Lewis won in a time of 9.99s, with Sam Graddy of the USA coming 2nd in 10.19s. The long jump was on the 6th of August. Lewis easily won this with a leap of 8.54m, 30cm ahead of Gary Honey of Australia who took the Silver medal. Carl Lewis won 4 Gold medals at the 1984 Los Angeles Olympics, in the 100m, 200m, Long Jump and 4x100m relay. The 200m final was on the 8th of August. Lewis won the Gold in a time of 19.80, setting an Olympic record. The USA got a clean sweep of the medals, with 2nd place going to Kirk Baptiste, in 19.96, and 3rd place to Thomas Jefferson in 20.26s. To cap a truly remarkable week for Lewis, on the 11th of August he and his USA team-mates won the 4x100m relay in a World record time of 37.83s. This is a video summarising Carl Lewis’ remarkable achievements at the 1984 Olympics. The other highlight of the 1984 Olympics for me was the resumption of the Sebastian Coe v Steve Ovett rivalry in the middle distance events. However, by this time the pair had been joined by Steve Cram. Cram had burst onto the scene in 1982, during a year when Coe and Ovett were largely absent from races due to injuries. In that year, Cram won the 1500m at the European Championships in Athens, and he went on to win Gold in the 1500m at the 1983 World Athletics Championships in Helsinki. Going into the 1984 Olympics, Sebastian Coe held the 800m World record with a time of 1m41.73s, a record which would not be beaten until 1997. Steve Ovett held the World record in the 1500m with a time of 3m30.77s. So, just as in 1980, Coe was favourite to win the 800m and Ovett was favourite to win the 1500m. But, as in 1980, Coe was not to win his favourite event. After a 1982 which was ravaged by injury, in 1983 Coe was struck down with a rare glandular illness. Ovett was also not on top form. He struggled to even qualify for the 800m final, collapsing over the line in the semi-finals in 4th place. He was suffering from breathing difficulties, possibly due to the Los Angeles pollution. Ovett was advised not to run in the 800m final by the team doctors. The 800m final was on the 6th of August, and was won by Joaquim Cruz of Brazil in a time of 1m43.00s, with Sebastian Coe coming second in 1m43.64s. 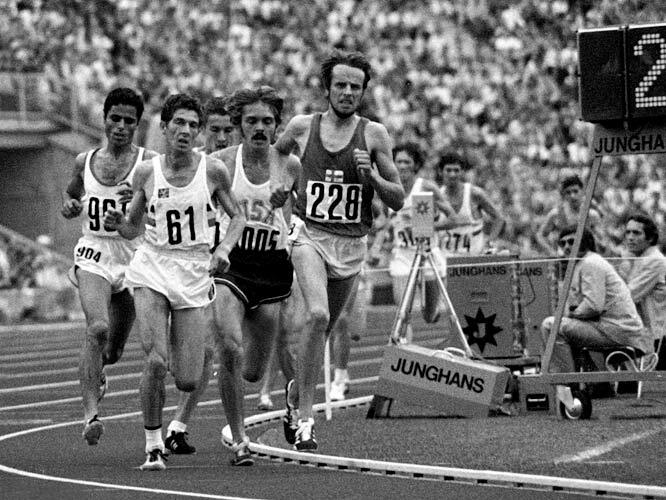 Steve Ovett trailed in in 8th and last place, clearly suffering. Here is a video of the 800m race at the Los Angeles Olympics. It includes some footage of Ovett collapsing over the line in the 800m semi-final. The 1500m final was held on the 11th of August, 5 days after the 800m final. Ovett, Coe and Cram all qualified for the final. Ovett again barely qualified for the final, coming joint 3rd in the semi-final. 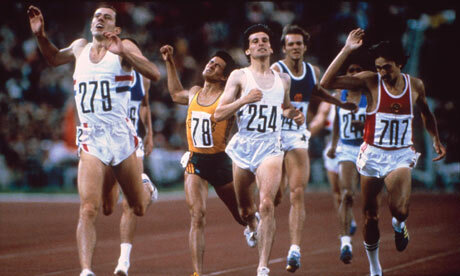 In the final, with just under one lap to go, Ovett dropped out, unable to continue. Coe, Cram and Spanish runner Abascal were clear of the rest of the field. Coe and Cram passed Abascal with 200m to go, but Coe managed to hold off Cram in the home straight to win, and become the first athlete ever to retain the 1500m Olympic title. The race was won in a time of 3m32.53s, with Steve Cram coming 2nd in a time of 3m33.40s. Here is an extended video of the 1500m race at the Los Angeles Olympics. Was this the best 1500m race at an Olympics? The highlight for me of the 1980 Moscow Olympics was the show-down between Sebastian Coe and Steve Ovett in the middle distance events. Coe and Ovett were the best middle distance runners of the time. 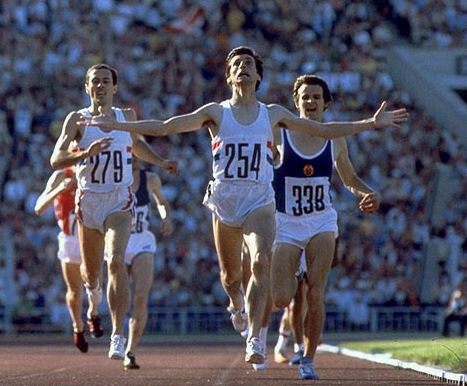 Going into the 1980 Olympics, Coe held the World record at 800m, with a time of 1m42.33s, and Ovett and Coe jointly held the 1500m World record with equal times of 3m32.03s. Prior to the Moscow Olympics, Coe and Ovett had avoided racing each other for over 2 years. Each had been setting World records, but always in separate races. Their show-down at Moscow was the most eagerly anticipated athletics event for many years. The 800m race was first. Coe was the World record holder so, naturally, was expected to win. But in a dramatic turn of events, Ovett beat him into second place, running a far superior race tactically. Coe was devastated to lose the event for which he held the World record. Steve Ovett beating Sebastian Coe in the 1500m at the 1980 Moscow Olympics. Here is a video of the 800m final. A few days after the 800m was the final of the 1500m. Steve Ovett was undefeated at this distance for over 3 years. Having beaten Coe in the 800m, Ovett was the hot favourite to add the 1500m title. 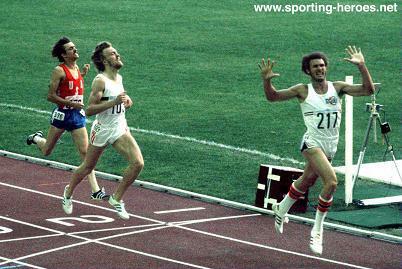 Remarkably, Coe managed to pick himself up from the devastation of losing the 800m and beat Ovett. Sebastian Coe beating Steve Ovett in the 1500m at the 1980 Moscow Olympics. Here is a video of that remarkable race. The American Government decided that the USA would not compete at the Moscow Olympics, in protest at the Soviet Union’s invasion of Afghanistan in December 1979. The United States led an international boycott, in which 65 countries took part, including West Germany, Japan, China and Canada. As a consequence, many of the events had the best competitors absent. Nowhere was this more true than the men’s 100 metres. Apart from 1960, 1972 and 1976, the USA had won the men’s 100m in every Olympics since 1932. The 1980 Olympics men’s 100m was won by Scotsman Alan Wells, in a time of 10.25s (this compared to the World record of the time of 9.95s). It was the slowest time to win the men’s 100m since the Melbourne Olympics of 1956. The 2nd placed runner, Silvio Leonard of Cuba, was awarded the same time, it was the closest 100m finish in Olympic history. Here is a video of Alan Wells winning that 100m. What is your highlight of the 1980 Olympics? Just a quick post today, as I need to be getting on with doing things outside on a rare dry sunny day in Cardiff. As I have mentioned before, I am a huge fan of Leonard Cohen. I consider him to be one of the best lyricists who has written songs in the last 50-60 years. 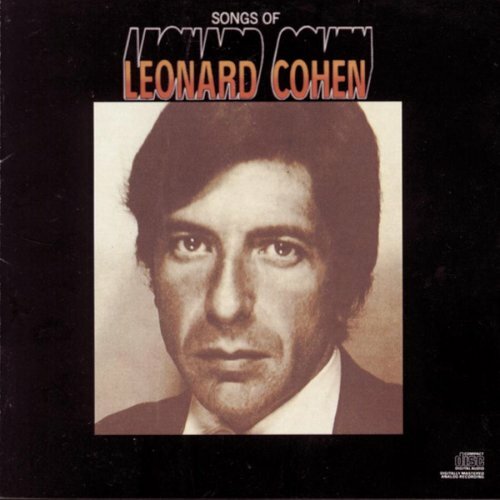 This song, So Long Marianne is from his debut album Songs of Leonard Cohen. So Long Marianne comes from Leonard Cohen’s debut Album “Songs of Leonard Cohen”, which was released in 1968. What is your favourite Leonard Cohen song? When does Ramadan begin? Well, it all depends on when the New Moon is first sighted. We know exactly when the New Moon happened, it was at 05:25 UT (Universal Time, essentially the same at Greenwich Mean Time) on Thursday the 22nd this month. The Moon phases this month. 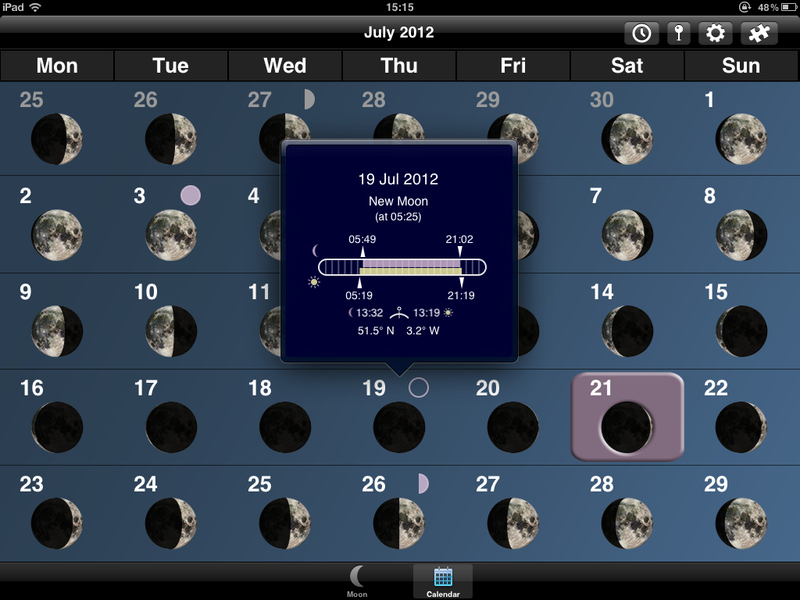 As can be seen, the New Moon happened this month at 05:25 UT (Universal Time) on Thursday the 19th of July. But, that is not when Ramadan traditionally begins. Ramadan begins at the beginning of the Muslim holy month of Ramadan, in fact the month of fasting is named after the month. Ramadan is the 9th month in the Islamic calendar. Unlike the calendars used in the Gregorian calendar, in the Islamic calendar, the months traditionally start at the first sighting of the New Moon. Not when the New Moon happens, but the first sighting of the New Moon (or, strictly speaking, a crescent Moon). Of course, by definition, you cannot see the New Moon, because the Moon is between the Earth and the Sun (not directly in line with it unless there is an Eclipse), so in fact to see the “New Moon” you have to wait until the Moon has passed this point by a certain amount, whereupon you can see a Crescent Moon. A diagram showing where one can expect to see the first sign of New Moon in the month of Ramadan. 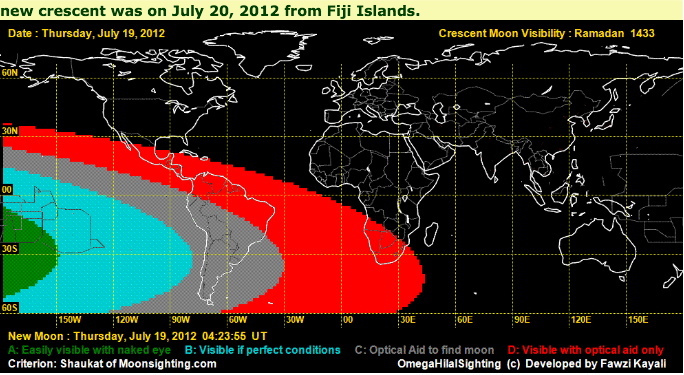 Apparently, it was first seen on July 20th from the Fiji Islands. So, as the first sighting of the Moon after the New Moon on Thursday the 19th appears to have been on Friday the 20th, that is when Ramadan began this year. Of course, next year, we know it will move forward by between 10 and 11 days, as I explained in this blog. My 3 main memories of the 1976 Olympics is Montreal are Alberto Juantorena from Cuba winning the men’s 400m and 800m, Lasse Viren of Finland completing the 5,000 and 10,000m double, and Nadia Comaneci of Romania stealing the show in the women’s gymnastics. Alberto Juantorena won the 400m and the 800m at the Montreal Olympics. This was the first, and so far only, time that this feat has been accomplished. He won the 800m in a World record time of 1:43:50, and three days later he won the 400m in a time of 44:26, the fastest time ever run at low-altitude. Alberto Juantorena of Cuba winning the 800m at the 1976 Montreal Olympics. Because the Cuban running kit at the 1976 Olympics was white, Juantorena was dubbed white lightning by the press. He is the only athlete to have ever won the 400m and 800m double at the Olympics. Here is a video of Juantareno winning the 800m and the 400m at the 1976 Olympics. The second most memorable thing for me at the 1976 Montreal Olympics was Lasse Viren of Finland winning the 5,000m and 10,000m double. Virren had, in fact, also won these two events at the 1972 Munich Olympics, becoming the only person to retain the 5,000m title at the Olympics. In the 10,000m Viren and Portugal’s Carlos Lopes dropped Great Britain’s Brendan Foster at about 8,000 metres, and then Viren’s superior finishing pace took him past Lopes with about 450m to go. In the 5,000m Viren dominated the race with a devastating display of front running over the last few laps. Viren also competed in the 1976 Marathon, only 18 hours after finishing the 5000m. He finished fifth in a time of 2:13:11. Here is a video of Lasse Viren winning the 5,000m at the 1976 Olympics. If the 1972 gymnastics were domianated by the dimunitive Soviet gymnast Olga Korbut, 1976 was dominated by the Romanian Nadia Comaneci. She won 3 Gold medals, in the Uneven bars, the balance beam and the individual all-around. She also won silver in the team all-around event. Comaneci made Olympic history by becoming the first gymnast ever to get a perfect 10 score in an event – in the uneven bars and the balance beam in the individual all-around event. She also got a perfect 10 score in the final of the individual uneven bars event, and in the individual balance beam event. 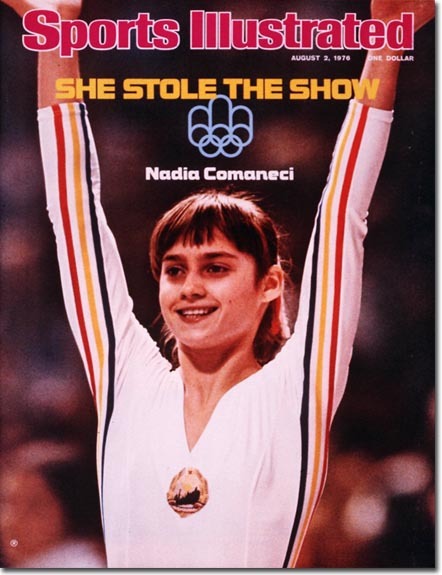 Nadio Comaneci dominated the Gymnastics at the 1976 Montreal Olympics. She obtained the first ever perfect 10 score. Here is a video of Comaneci getting the first perfect 10 in history. The 1976 Olympics were also marred by the boycott of many African nations in protest at a New Zealand All Blacks rugby tour of South Africa. Congo led a boycott by 28 African nations. This, of course, robbed the Olympics of many of the finest athletes, and marked the first of several olympic games which would be affected by boycotts. What is your highlight of the 1976 Montreal Olympics? If I’m not sure whether I remember Bob Beamon’s leap in the 1968 Mexico City Olympics, I do vividly remember the 1972 Olympics in Munich. For me, the most memorable part of the games was Olga Korbut, the diminutive Soviet gymnast who melted the hearts of the World. Although often referred to as “Russian”, she was in fact from Belarus. Prior to the 1972 Olympics, I think the general view of Soviet women was that they were dour shot-putters about twice the size of the typical adult male. 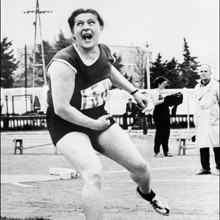 Think Tamara Press, who won the shot put in the 1960 Rome Olympics and the 1964 Tokyo Olympics. Olga Korbut was the complete opposite to Tamara Press. Born in 1955, she was 17 when she competed at the Munich Olympics. She won 3 Gold medals at the Munich games, in the balance beam, the floor and the team event. In addition to her infectious smile and general cheekiness, she is also remembered for breaking down in tears when she performed badly in the uneven bars. Olga Korbut as the 1972 Munich Olympics. She competed with a smile on her face. Here is footage of Korbut performing on the balance beam at the 1972 Olympics, for which she won the Gold medal. It is said that Korbut revolutionised the sport of gymnastics. She certainly made it more popular, there was a huge surge in interest in young people learning gymnastics after the 1972 Olympics, and the kid of small, delicate body-type which Korbut had came to dominate women’s gymnastics over the more powerful, muscular gymnasts before her. 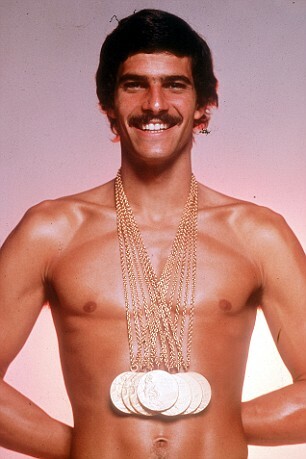 Mark Spitz won 7 Gold medals in the swimming pool at the 1972 Munich Olympics. 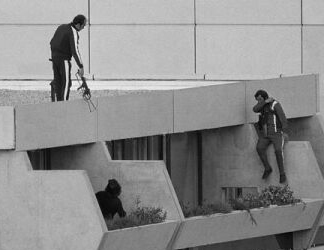 Sadly, the 1972 Munich Olympics will also be remembered for what has become known as the “Munich massacre“, the tragedy of the murder of 11 Jewish athletes by a group of Palestinian terrorists who stormed their accommodation in the Olympic village. 5 of the 8 terrorists were then killed by the German police in a failed rescue attempt. The 1972 Munich Olympics was marred by the murder of 11 Jewish athletes in the Olympic village by a group of Palestinian terrorists. 5 of the 8 terrorists later lost their lives in a botched rescue attempt by the German police. The World was shocked by these events. Even as an 8 year old I was aware of something tragic having happened, although I did not understand the reasons for the attack. Sadly, it also started the beginning of a trend of using the Olympic Games to make political statements, something which would mar the Games for the next 16 years.